Two things led me to go and see Théâtre du Châtelet’s production of “Singing in the rain” even though it is sold out until January 11. 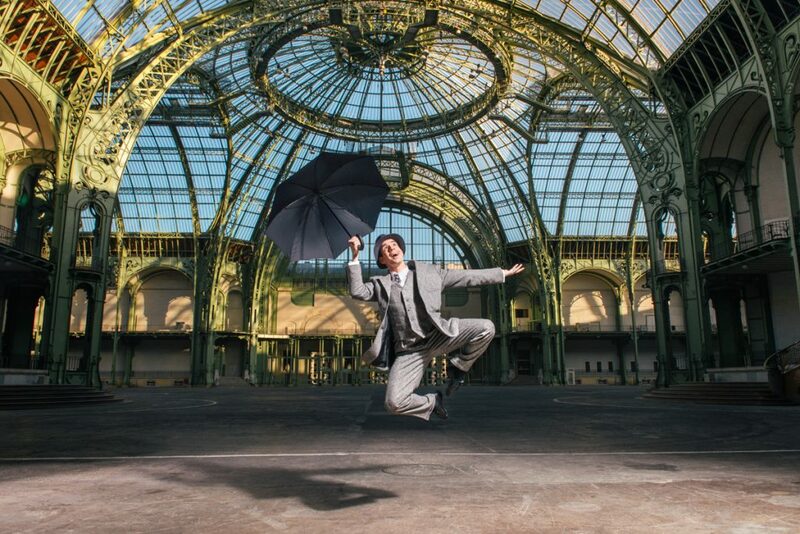 Robert Carsen, the genius director who has never disappointed me, and the fact that it takes place at the Grand Palais, under its huge glass roof, an unbeatable decor. It was great fun! I was not disturbed by the fact that there were no tickets available and that I had missed the waiting list opportunity of the day because I was at lunch with a lovely friend (you just need to register on the Châtelet website and they send you an alert). So I decided to go with a little sign saying “I buy tickets” and try my luck. This is what I used to do at Carnegie Hall to listen to Vladimir Horowitz when I was a student… And Santa Claus rewarded me! When I walked into the Protocole office at the entrance of Grand Palais asking if maybe some guests were not coming, the nice lady behind the desk handed me two tickets!!! How more lucky can you get? The ambiance was fabulous with the 2 800 spectators walking in calmly and going through security, which was organized as professionally as for a football game. 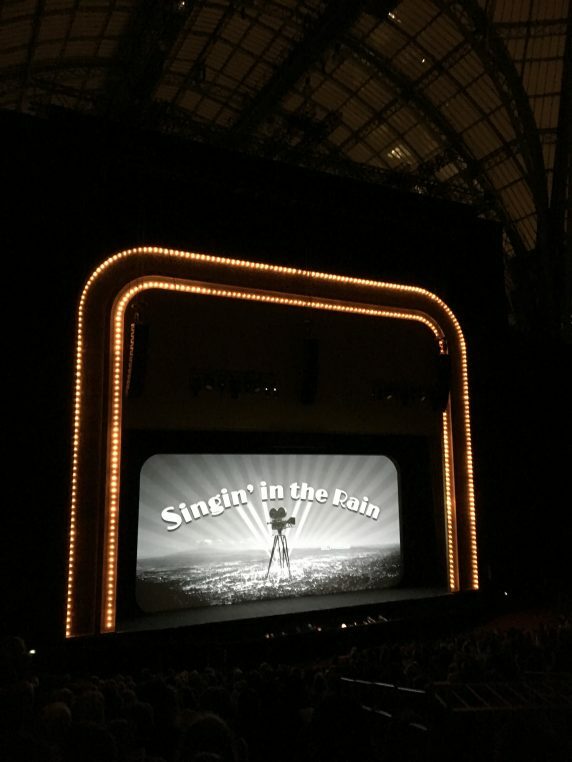 I handed in my umbrella to the charming coat check, for it was pouring that evening (a lovely introduction to the show) and walked up to my seats which were on a row with twenty five 12 years old from the 12th arrondissement who did not stop jumping up and down with the music. It made the evening even more fun.. 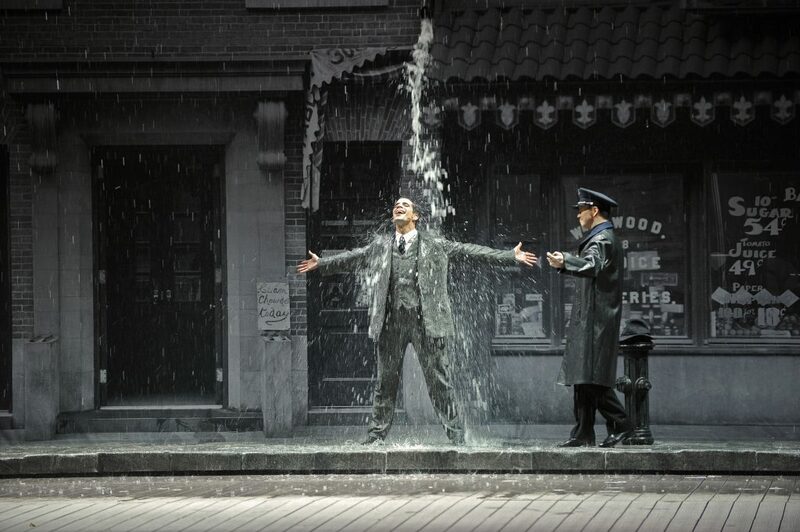 The show designed by Canadian director Robert Carsen and choreographed by Stephen Mear is a true success because of the elegance of its staging. Mostly done in black and white, with a little gold at the end, Anthony Powell‘s costumes are just magnificent in refinement and in glamour. No wonder this Brit is the laureate of three Academy Awards! The château de Versailles features constantly with scenes of the movie “The Dancing Cavalier” being shot repeatedly in the Galerie des Glaces and we follow the adventures of Felipe du Bois and Gaspard de la Nuit with children’s anticipation. We are in 1927, when the first talking film “the Jazz singer” comes out and the glamorous Hollywood couple formed by Don Lockwood and Lina Lamont are going to be cut out from movies if they don’t start to talk properly… The resulting film is a huge success thanks to the voice of Kathy Selden who is a theater trained actress. The music and singing very much “helped” (?) by microphones is not the strong part of the show. Especially when the heating pomps blow at full speed in the back of the stage and the decors are being moved noisily… The huge size of la Grand Nef is fantastic but it obviously has its drawbacks including the cold. I had been warned and was wearing my best furs. 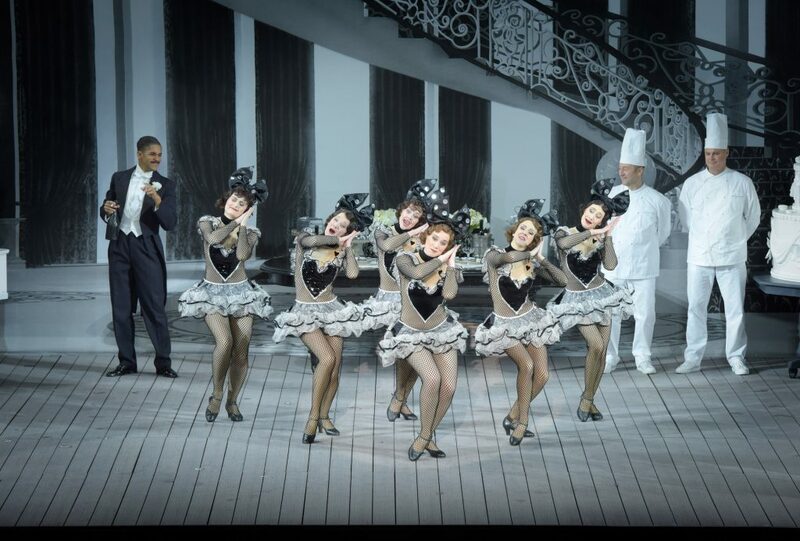 The lyrics are so well known that it is wonderful to be there but I noticed that nobody was singing with the actors. On Broadway it would have been different, the great American audiences would be more cheerful. Yet, we all left the show happy in our hearts, it made for a perfect Christmas evening and most spectators were probably going to a Châtelet production for the first time. It was multigenerational with the common denominator being blue jeans worn by everyone. 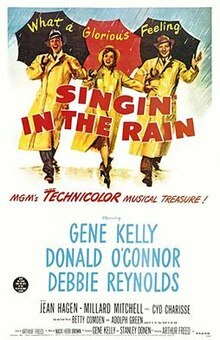 The kids next to us were delighted for most of the show which could have been a little shorter… Of course we all had in mind Gene Kelly in the 1952 movie, probably the best movie musical ever made? And we can go back to our living room and watch it cosily.